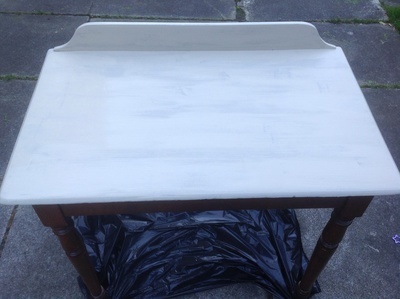 What do you do with a piece of furniture that's past its best, or a bit stained, like this one? 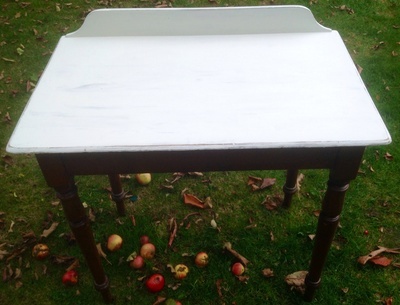 I don't like to throw things away that are still serviceable, if a little marked, so I love chalk paint. 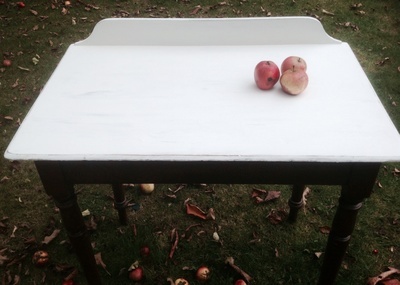 It's a great way to bring a new lease of life to old furniture in a shabby-chic sort of way. And although I've used a neutral grey and white, to go with my decor, you could use any combination of colours to match your own colour scheme. First, plan which part of the furniture you are going to paint. Because my stairs are painted white, with natural, stained wooden tops, I decided to go with the mirror of that: leaving the legs natural and painted the table top. 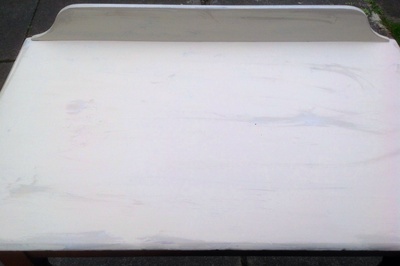 Prepare the surface for painting. 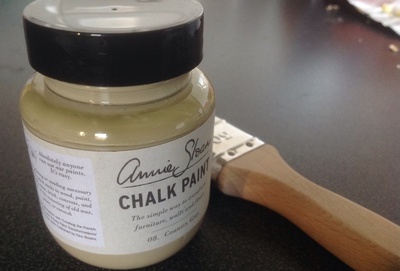 The great thing about chalk paint is that it doesn't need special primer, so all the surface needs is a wipe to make sure it is dust-free. 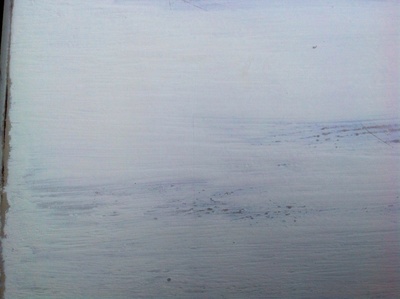 Paint a single coat in your first colour - this is the one that will show through when you distress the surface later. I chose a neutral grey. 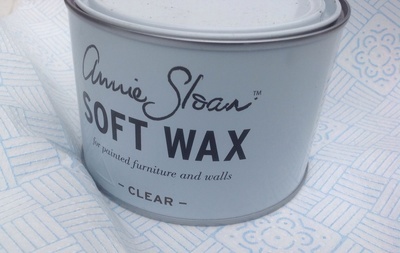 Using a cloth or thick paper, rub wax on all the edges and surfaces that would receive wear. 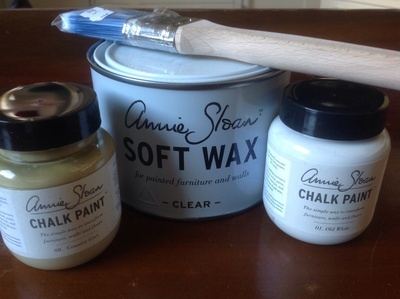 This will make it easy for the top surface of the paint to rub off when you rub with your fine-grade sandpaper later. 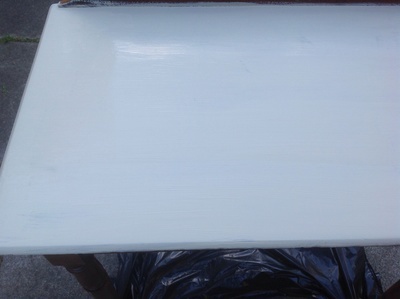 Paint a coat of white paint over the original colour, and leave to dry. 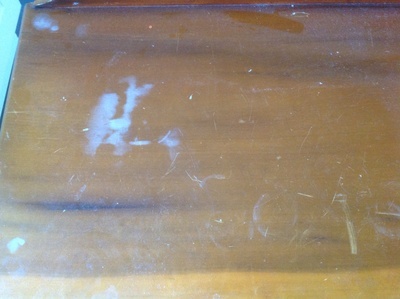 When it's completely dry, take the sandpaper and gently rub over the surface of the table. 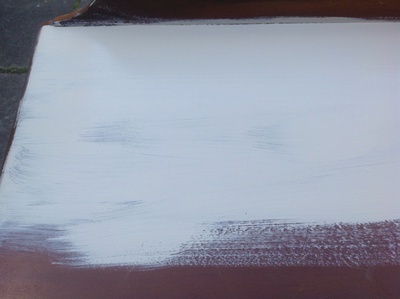 The white paint should come off leaving the paint colour underneath showing. If you want an even more distressed look, in some parts, rub a little harder and the original wood will show through slightly too. 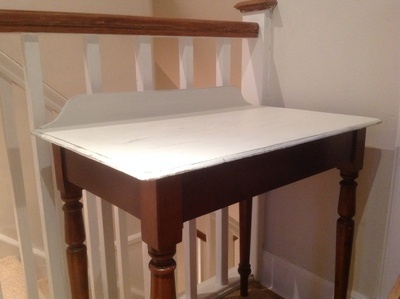 Using a damp cloth, wipe away any paint residue. 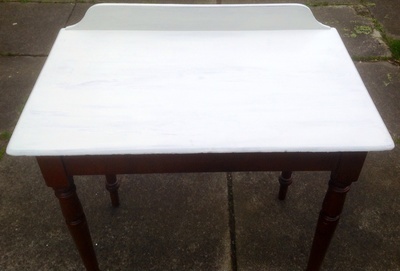 For a harder-wearing surface you can then use furniture wax over the white paint.